“Calling attention to the issues of stereotyping was an audacious and timely message in today’s environment. 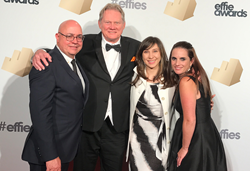 Conill and Procter & Gamble were among the winners of the 2017 North American Effie Awards, earning Bronze honors in the Hispanic category for the Tide brand’s Wash Away Labels marketing campaign. The award was presented at a gala event, held last night in New York City. Founded in 1968 as the nation’s first Latino marketing agency, Conill is currently among the most highly awarded multicultural agencies in the U.S. It has been recognized in Advertising Age’s annual Agency A-List Report in seven of the past ten years, including Multicultural Agency of the Year honors in 2011 and 2007. The agency’s roster of clients includes Aflac, Denny’s, Nationwide, Procter & Gamble, T-Mobile and Toyota Motor Sales.